Blanchefontaine, a Swiss watchmaking company, was founded in 1998 by Jean-François Muller. The firm is located in the heart of the Canton of Jura in Switzerland, recognized as being the real center of expertise and know-how in the watchmaking industry. For more than 10 years, the company has been developing and producing watches for international companies, associations, agencies and public sector. Blanchefontaine history is closely linked to that of its founder, Jean-François Muller. Immersed from his earliest years into the watchmaking universe of his grand father’s workshop, he quickly choose to link his professional activity to his passion. He began his apprenticeship in Undervelier at the foot of the Jurassian Mountains, and then he continued his training in various local watchmaking firms where he developed his know-how and his skills. In 1989, he became director of Gigandet SA, a 50 years experienced company in creation and production of Swiss watches, which exported more than 300’000 watches worldwide yearly. In 1998, he decided to create his own private label organization. This enabled him to work in a free and independent way, surrounded by dynamic and reactive partners knowing how to meet the expectations of demanding clients. He choose to call this new challenge “Blanchefontaine” which reminded him of the moments spent during his childhood looking at the seven white fountains springs near he used to live. He set up his business in Bonfol, in the Ajoie, the village where Louis Chevrolet lived before crossing the Atlantic to succeed in a brilliant career as an entrepreneur and racing car driver. 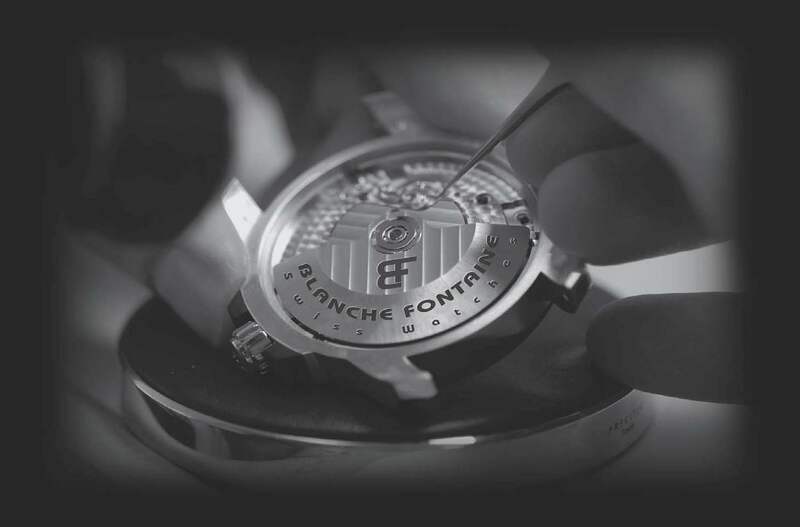 12 years later, Blanchefontaine continue to stand by its values and has developed a solid network of skills in development and production of custom made Swiss watches respecting confidentiality. Blanchefontaine helps to associate your image to a quality Swiss made product with an exceptional value for money. All the possibilities of personalization will be available to you on the basis of one of its collection models. Blanchefontaine will advise you on the design of your dial, choice of hands, bracelet and different possibilities of customization matching your request and communication concept.Each watch of the collection can be personalized by printing your logo, a text on the dial and/or on the caseback to better convey and valorize your image. Its «Private Label» department provides, within a professional network of skilled employees, all stages needed for the custom made development of your watch collection. Its designers, technicians and watchmaking partners, used to interpreting the image codes and strategies characteristic of each brand, will know how to suggest original creations respecting your specifications.